This photograph was taken today, June 3, 2011. 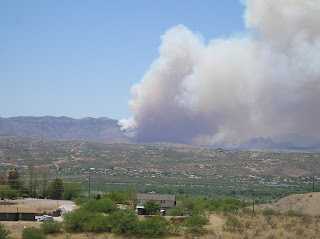 Inside the center of smoke plume is the Atascosa Ranch House, residence of David and Edith Lowell, in Rio Rico, Arizona. Ten miles north of the Mexican Border. The Forest Service determined to allow this fire to jump Peck Canyon South and go up the North face of the Atascosa Mountains rather than attempt to control the fire, they are simply watching the fire now for four days rather than trying to fight it or control it. The North Lowell allotment grazing pastures went up in smoke the last three days and the Forest Service is going to allow the second allotment to go up today. The Lowell's will have to sell their cattle because there is no grass for them to graze on. The drums along the border say that Border Patrol jumped a group of 12 marijuana backpackers who intentionally set the mountains on fire to effect their escape. Allegedly, between two and three of the illegal alien marijuana backpackers were apprehended and admitted setting the fire. Also, one of these arsonists is reported to be on life support at a local American hospital. The beating drums also say that the Forest Service will not admit that the fire was caused by illegal aliens, only that it is human caused. Some even wonder if the illegal aliens will be charged or just kicked back across the border. The border is not secure, America is in jeopardy as are all residents along the Arizona Border. Do not believe otherwise. Ranches carries all the facilities with a spadeful life in it.